DeBartolo Development plans to unveil a major entertainment venue at its $500 million, 67-acre Macy’s-anchored Ka Makana Alii regional shopping mall in West Oahu, the Florida-based developer’s president told PBN on Tuesday. The entertainment venue, which the developer hopes to announce soon, will be a place to showcase live entertainment that will drive tourists out to West Oahu,Edward Kobel, president and chief operating officer of DeBartolo Development, told PBN. Kobel declined to divulge the name of the entertainment company, although he did note that the idea originated during a stop in Atlanta. “It’s much more than a mall,” he said of Ka Makana Alii, which started construction on its first phase about six weeks ago. “It’s a town center. Kobel pointed out that the entertainment venue being considered is something that really does not exist in Hawaii, and that it will drive employment and sales to Ka Makana Alii. The mall already has announced plans to open a Consolidated Theatres location, which will include eight screens. On Thursday, DeBartolo is holding a groundbreaking ceremony for the Kapolei mall, which will include such speakers as Gov. David Ige, Honolulu Mayor Kirk Caldwell, Jobie Masagatani, chair of the Department of Hawaiian Home Lands, and Kobel. The developer also will be making a donation to R.E.A.C.H. Out Hawaii and Kapolei Middle School at the ceremony. 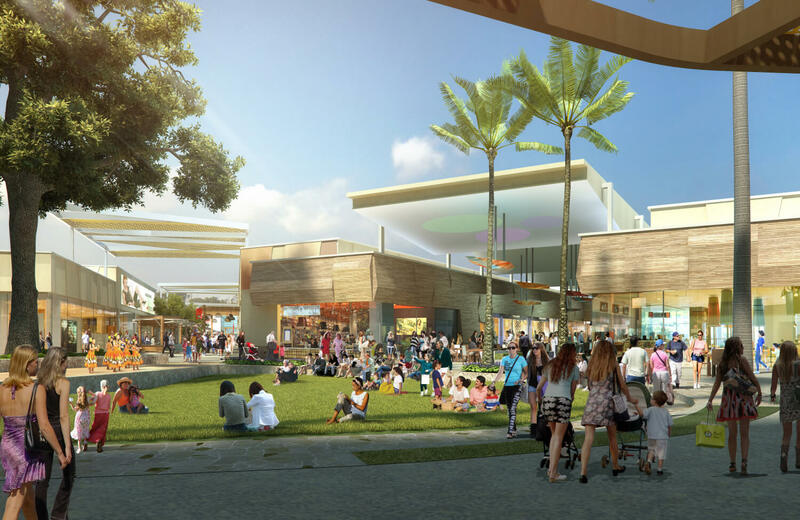 Construction on phase one of Ka Makana Alii, which includes more than 750,000-square-feet of retail, dining, entertainment and hotel space, is scheduled to be done by late 2016. The developer recently closed on a $167 million construction loan with Union Labor Life Insurance Co.The cost of developing the first phase is north of $250 million, with the second phase estimated at about $250 million. Rich Hartline, vice president of development for DeBartolo Development, told PBN that the first phase includes 51 acres, with the second phase, which has no start date yet, utilizing about 16 acres. The mall’s 65-year ground lease with DHHL commenced on Dec. 1. The project’s development team includes Architects Hawaii Ltd., Belt Collins Hawaii LLC and Nordic PCL Construction Inc. Colliers International Hawaii and Retail Union are handling the leasing for the project, while JLL is the management company. In addition to Macy’s, the other announced tenants include H&M, Forever 21, Gap and Banana Republic. Hilton’s Hampton Inn & Suites Hotel also will open its first location in Hawaii at Ka Makana Alii.